Hope dwindled for four British sailors missing off the coast of Massachusetts on Friday after a Coast Guard crew found and inspected the capsized yacht and discovered its life raft stowed and unused. The update of an earlier Coast Guard press release, issued Friday night, said the discovery via "underwater imagery clearly identifying the raft in its storage space,"indicated the life raft on the 40-foot Cheeki Rafiki “was not used for emergency purposes.” It said the photo was "shared with and acknowledged by the families." Earlier, the agency said that a helicopter from a Navy warship searching for the missing sailors spotted the yacht’s hull, which had previously been spotted by a commercial vessel last Saturday, about 1,000 miles offshore. A Navy boat crew and swimmer found the boat's cabin was completely flooded and its windows shattered. 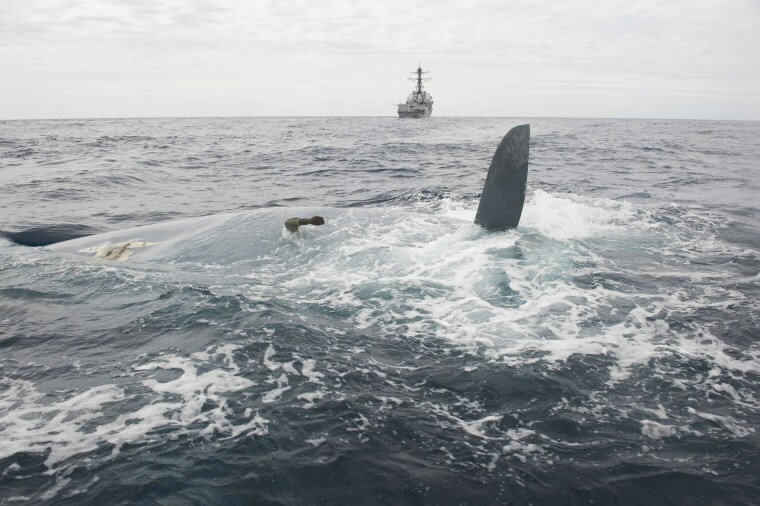 The vessel's keel also was broken off, causing a breach in the hull, the release said. The swimmer knocked on the hull and reached an arm's length below the waterline with no results. The release noted that surface swimmers are not trained for dive operations. The Coast Guard said the search for the ship's four crew members was suspended Friday night. The Cheeki Rafiki was sailing back to the U.K. from a regatta off the Caribbean island of Antigua when the boat started taking on water on May 15, about 620 miles east of Cape Cod, Mass. The crew sent a final radio message early the next morning, but has not been heard from since. The four sailors on board – captain Andrew Bridge, 22, and crew members James Male, 23, Steve Warren and Paul Goslin, 56 – are all described as experienced and family members had expressed hope that they were able to get into a life raft before the yacht capsized.